It has taken me way way too long to get to this blogpost! And it's such an important one!! I recently blogged about the importance of printing your images, and while that option is something new I'm now offering to my precious clients - the ability to print photos directly from their custom gallery - there's something else I've been offering for a while to my wedding clients, and I'm just now getting around to talking about them! Wedding and engagement albums!! AHH! Let me start by saying some of same things I said in my post about printing your photos... Tangible photos are so important. And I for one can tell you - I have such a limited amount of photos of my family, especially my parents. And there are truly 5 total photos in my possession of their wedding day. So naturally, that means there isn't a wedding album in existence. I've heard so many people say how much they loveee pulling their parents' wedding album off the shelf, settling down with a cozy blanket, and just flipping through those precious pages, oh so slowly. I feel like the ability to do that is a gift! And the only way you or your kiddos are going to have that gift, is by choosing to have your photographer create your first family heirloom! Just like printed photographs, having something tangible in your hands like a wedding album, or engagement album is so important. Having that crazy-special time in your life that you were newly engaged, beaming with excitement, blushing with admiration, and completely wrapped up in love together - all captured and then put together for you in an album, is something you'll treasure always. 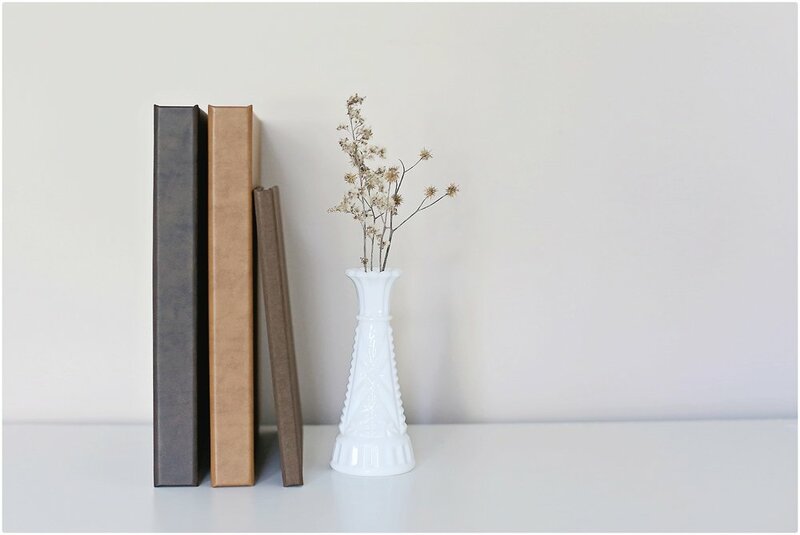 Seeing your perfect wedding day beautifully chronicled in a luxurious leather-bound album which you can pick up any day, or every day, and relive those moments one page at a time. The details of your dress, your jewelry. The nervousness in your eyes as you got ready to go see the love of your life. The way he looked when he saw you for the first time. The way you threw your head back in laughter during your Dad's toast. The way you and your new husband danced the night away. These moments matter so, so much. And when I say that these albums beautifully chronicle your best days - I mean it in the way of a timeless high-end leather, or gorgeous linen bound album. Your choice, it's up to you, and you have an array of classic color options that won't ever go out of style. 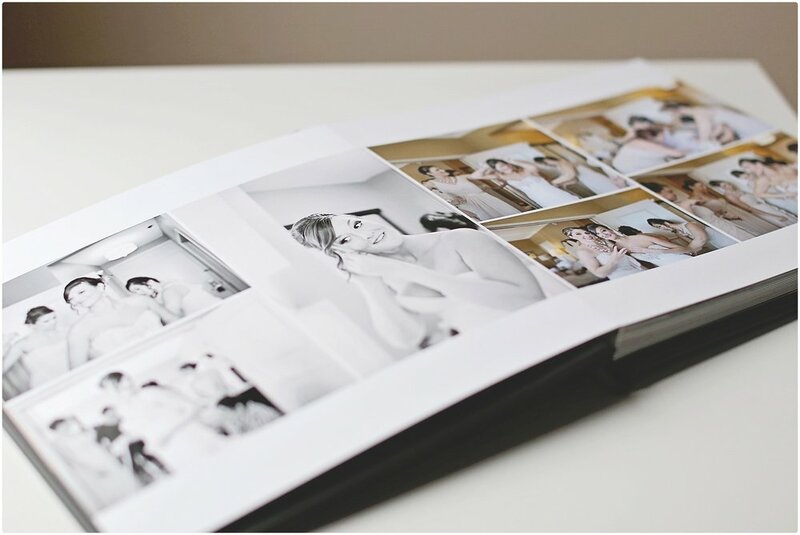 Wedding album pages are substantially thick cardstock with your images printed right on, and they create a gorgeous lay-flat style when your album is laying open. The pages are seamless, there is no gutter in the middle where images disappear in to. It's weighty, in a significant and important way - because it is. 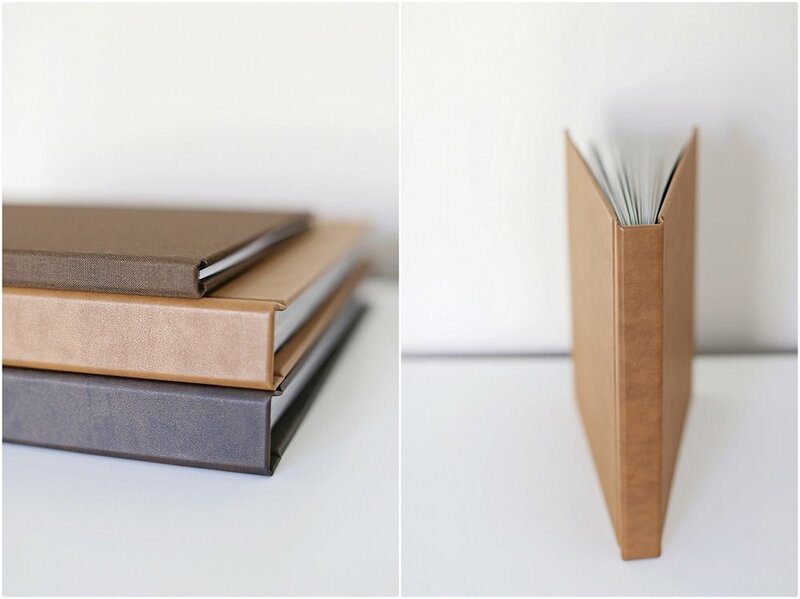 Your engagement album offers those same timeless high-end leather, or linen cover options. More of the same classic color choices for each. Your engagement images are printed onto thick paper which also offers a lay-flat style when the album is laying open. And, bonus - these albums are designed with specific paper which allows them to be written on.....so you could easily use your engagement album as your guestbook at your wedding, should you choose. Oh and did I mention the overall design for each is completely custom? Oh yes my friend, oh yes. No two love stories are alike, so in my mind...no albums should be alike! YOU choose the images you want in these albums, and I custom build a design, just for you and your story. And then YOU see it all online before the albums are printed, allowing you to make sure it is everything you ever dreamed - all before you're holding the finished beautiful product in your hands. I don't know what else there is to say, except that I LOVE when clients choose my wedding collections that offer such timeless gems like these! First family heirlooms you guys...the very first! !